I don’t want to jump too far down the rabbit hole as it pertains to the family of Ann Phillips (wife of John Corbo of Queen Anne’s County, Maryland). When and if we firmly establish that she is our ancestor – I’ll dig a little deeper. Suffice it to say that the Phillips surname is a fairly common one – and with just a perfunctory review of the records, it seems that their web is tangled just as tightly as ours is! After looking at the websites of several credible Phillips researchers it seems that the Phillips family is traced back to the late 1590s where the family was present in Devonshire, England. Many of the early settlers of Colonial Maryland came from the West Midlands of England. The Maryland Phillips family evidently begins with a man named John Phillips who is said to have come to Kent Island prior to its becoming a part of Maryland. For now, we will concern ourselves only with the immediate family of Ann Phillips. What we know about Ann comes primarily from the parish registers of St. Luke’s Episcopal Church in Church Hill, Queen Anne’s County, Maryland. 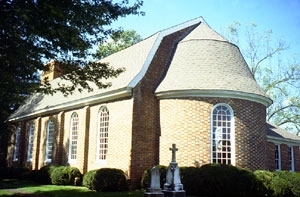 St. Luke’s, known as “the church on the hill,” is one of the oldest churches in Maryland – built in 1732 at a cost of 140,000 pounds of tobacco. The bricks used to construct the church were shipped over from England to replace the wooden church that had been built there in 1728. According to the Maryland Historical Society, all records are preserved intact, including births, baptisms, marriages, burials, vestry meetings and special occasions. While reviewing the register, line-by-line, I found two additional birth entries for Samuel and Ann Phillips: (1) David Phillips born 27 June 1741 and baptized 25 Sept 1741 (married Sarah Swift at St. Luke’s on 1 May 1759); and (2) James Phillips born 18 July 1752. Outside of these three birth records, I have been unable to unearth any further clues regarding Samuel and Ann Phillips of Queen Anne’s County. There are five additional Phillips’ marriage records in the St. Luke’s parish register (ranging from the 1740s to the 1750s); however, their connection to Samuel and Ann are unknown at this time. It could be that these are their older children (perhaps not baptized at St. Luke’s); Samuel’s children from a previous marriage; Samuel’s nephews; or perhaps they are not related at all. (Thomas Phillips married Mary Lawrence 17 Aug 1756; James Phillips married Sarah Lambdin 26 Dec 1743; Robard Phillips married Myratilla Serton 30 Oct 1744; Robard Phillips married Ann Lambden 31 Dec 1746; and Robert Phillips married Hannah Cross 1 Mar 1750). As I began to expand my search for Samuel and Ann Phillips, the records led me to Cecil County, Maryland. 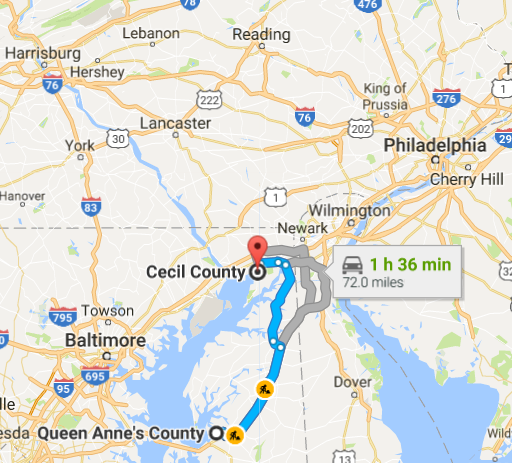 Cecil County lies to the north of Queen Anne’s County and borders Pennsylvania to the north and Delaware to the east. It was there that I found a marriage record for Samuel Phillips and Elizabeth Brooks – married on 19 Mar 1724. Many of the public trees on ancestry.com have Samuel’s wife listed as Elizabeth Ann Brooks. Of course, none of these trees are sourced in any way, and so it is uncertain whether this is the same Ann who is listed in the St. Luke’s parish register – or whether this is a prior marriage for Samuel. It is entirely possible that Samuel and Ann Phillips began their married life in Cecil County – had children there – and then relocated to Queen Anne’s County – and had their last three children there. In fact, I did locate a birth record in Cecil County pertaining to Samuel and Ann Phillips – a son named Isaac Phillips born 7 Jan 1738. The birth is registered in the parish records of St. Mary Anne’s Parish; his death is recorded there on 7 Aug 1739. This is somewhat in conflict with what we know about Ann Phillips because Isaac’s date of birth conflicts with hers (having been born 25 July 1738). It could be that one of the dates is incorrect – or it could be that this is not a family connection at all. Additionally, the parish records of St. Mary Ann Parish (Protestant Episcopal Church) in Cecil County indicate that Samuel Phillips and wife Elizabeth Brooks had children as follows: Elizabeth on 5 Apr 1725; Samuel on 19 Mar 1727; Catherine on 28 Apr 1734; Nathan on 21 Feb 1732; and Mary on 29 May 1737 – all prior to the birth of our Ann Phillips in 1738. At this point in time, I am inclined to think that Elizabeth Brooks and Ann Unknown – are two separate women. In a book entitled, Inhabitants of Cecil County 1649-1774 written by Henry C. Peden, I noted several land records (including 200 acres of St. John’s Manor) belonging to a Nathan Phillips in 1723. I next located a Will that was probated 4 May 1748 in Elk River, Cecil County, Maryland by the family of Nathan Phillips. Samuel Phillips is named in this Will as being the oldest son of Nathan Phillips – which would indicate that Nathan Phillips is Ann’s grandfather. I located two marriage records for Nathan Phillips (and it is assumed that Nathan was married three times) with his first wife (and Samuel’s mother) being unidentified. His second marriage took place in 1706 in Cecil County to Elizabeth Cousins; and his third marriage took place 18 Apr 1733 in Cecil County to Jane Simcoe. In addition to Samuel, it is believed that Nathan Phillips had the following children: a daughter named Elizabeth born 1720 who married James Boulden; a daughter named Sarah born 1725/1726 who married Johanes Arreams/Arrants; a son named Nathaniel; and a son named Thomas. According to Nathan’s Will, he left his plantation in Elk River, Maryland to his third wife Jane. His son Samuel is named in the Will as is John Foster (?) and a grandchild, John Phillips. After Jane’s death the estate was to be divided between James Boulden and Johaness Arreams (his sons-in-law). One of the witnesses was Manado Phillips, believed to be Nathan’s brother. 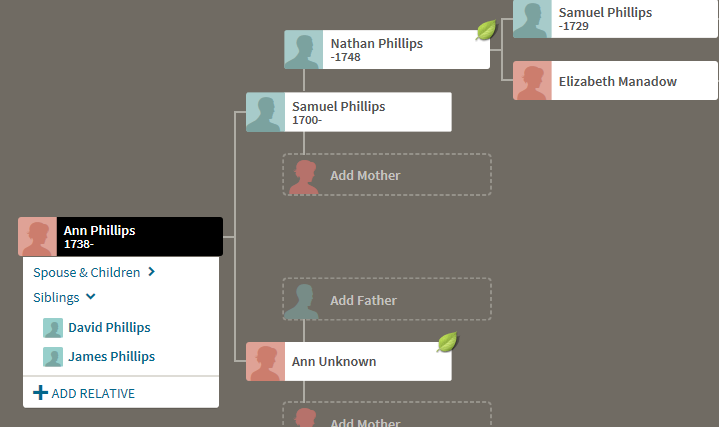 This family tree could be taken back one more generation to Samuel Phillips, the father of Nathan, grandfather of Samuel and great-grandfather of Ann – but I promised I would not jump down the rabbit hole!! At this point, the genealogy becomes very shaky and most of the dates listed online simply don’t add up. I am intrigued however to read that some of the descendants of Samuel and Nathan Phillips ended up in Anson County, North Carolina where we next catch up to John Corbo and Ann Phillips. Stay tuned to our next installment – John Corbo of Anson County, North Carolina. As a quick recap, a Jean Corbeau arrived in Philadelphia from Friedrichstal, Germany with his family in October of 1737. Now known as John Corbo, he quickly purchased land and settled in the Oley Valley of Pennsylvania. There is no record that would indicate the age of this Jean Corbeau/John Corbo; however, we know that in order to participate in the land transaction he had to have been at least 21 years of age. Assuming he was only 21 – his birth year would have been about 1717. It is possible that since he came with “a family,” that he was older than 21 at the time of the land transaction. We now fast forward eight years and shift our focus southward to Queen Anne’s County, Maryland. Germans (both from Germany and the Pennsylvania Dutch “Deutsch”) began to settle along the Chesapeake Bay as early as 1723 in the area that would become the City of Baltimore. It is across the Bay in Queen Anne’s County that we find a marriage record for a John Curbow (indexed incorrectly in various indexes as Carbos or Carboo) (Note – this is the first time we see the surname spelled Curbow). He married Ann Phillips on 27 Aug 1755 at St. Luke’s Protestant Episcopal Parish Church (located in Church Hill, Maryland). Ann Phillips was also christened in this same church on 14 Sept 1740 (she was born 25 July 1738). If this is the same Ann Phillips – then she would have been about 17 years old at the time of her marriage. Her parents were Samuel and Ann Phillips. Thankfully, the parish records of St. Luke’s are online as a special collection with the Maryland State Archives. I have reviewed all 58 pages of births, marriages and deaths from 1722 to 1850 – it only cost me some time, my vision and a cramp in my neck to discover several other related Phillips’ family members – but no other Corbo or Curbow families. This indicates to me that this was not John’s home church – that he was probably not born in the area – and that he probably didn’t live in the area. Additionally, there were no christening records located for any children born to John and Ann (Phillips) Curbow – which further indicates to me that they left the area shortly after their marriage. There are many unanswered questions about this John Curbow – we don’t know when he came to Maryland and when he left. He isn’t in any obvious records in Maryland – still much to learn – and I will update this post if and when records are discovered. QUESTION: Is this Maryland John Curbow the same person as the Pennsylvania John Corbeau/Corbo? Or is this his son? Or are they related at all? Stay tuned for the next installment: The Phillips Family of Queen Anne County, Maryland.